Jackie Kennedy by Andy Warhol – Andy Warhol’s Jackie Kennedy portfolio is a rare collection containing images of the iconic Jackie Kennedy. Each piece depicts Jackie Kennedy in different defining moments of her life. These works by Andy Warhol are not meant to form a cohesive narrative, but to pay tribute to Jackie Kennedy following the assassination of President John F. Kennedy. Warhol began his “Jackie” series shortly after the assassination of John F. Kennedy in Dallas. As the basis for his paintings, he selected eight photographs from the mass-media coverage of the assassination and cropped the pictures to focus on the president’s widow. The high contrast of magazine and newspaper photographs served the artist well in his process of enlarging the images and transferring them to canvas via silk screen. During 1964 Warhol produced an undocumented number of individual paintings of Jackie Kennedy on canvases 20 by 16 inches, which were sold as single units and in multiple configurations. In this particular group, she is seen in four different “poses” that present a range of expressions and costumes provided by journalists images. 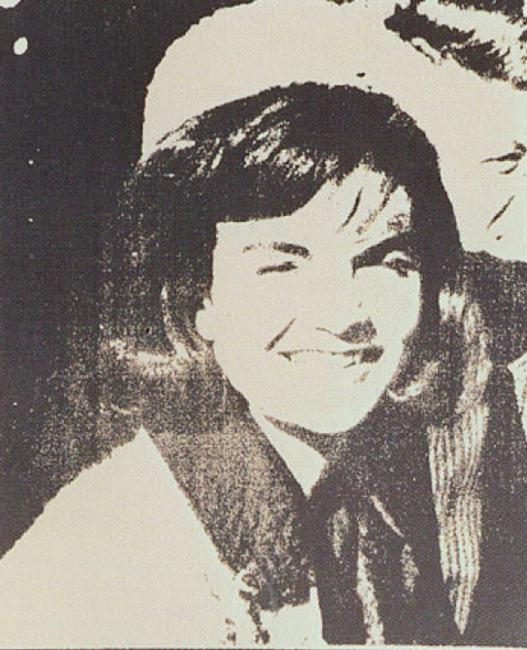 The view of Jackie standing with a uniformed soldier by her side, for example, crops and reverses the cover photograph from Life magazine on December 6, 1963.